A classroom periodic table of the elements found at the University of St Andrews in Scotland is the oldest known in the world. It was discovered in 2014 by Dr. Alan Aitken in the storage area of the School of Chemistry. He was cleaning out the clutter of chemicals and equipment that had built up since 1968 when he came across a roll of old teaching charts. Among them was a chart of the period table that was so old the paper flaked to the touch. Siberian chemist Dmitri Mendeleev first arranged the known elements by their atomic mass after seeing them all fall into place in a dream. He was writing a textbook for the chemistry course he was teaching, and realized elements with similar properties also had similar atomic weights, or weights that increased at a regular rate. He presented his chart and the periodicity of the elements to the Russian Chemical Society in 1869. 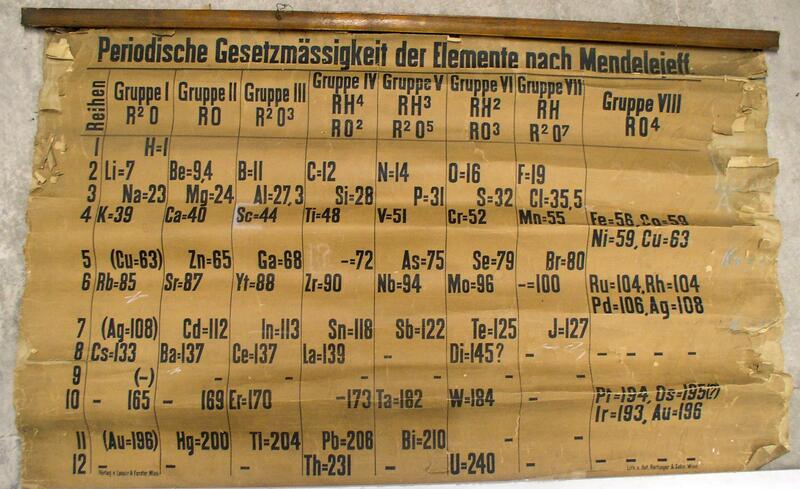 Other scientists had independently realized that the elements could be organized in periods and created tables in the 1860s, but Mendeleev’s was the simplest and made predictions that would be confirmed accurate with the discovery of more elements. In 1871, he released a second table correcting a few errors in the first. The chart found at St. Andrews is similar to the 1871 version, but printed some years later. A researcher at the University, M Pilar Gil from Special Collections, found an entry in the financial transaction records in the St Andrews archives recording the purchase of an 1885 table by Thomas Purdie from the German catalogue of C Gerhardt (Bonn) for the sum of 3 Marks in October 1888. This was paid from the Class Account and included in the Chemistry Class Expenses for the session 1888-1889. This entry and evidence of purchase by mail order appears to define the provenance of the St Andrews periodic table. It was produced in Vienna in 1885 and was purchased by Purdie in 1888. Purdie was professor of Chemistry from 1884 until his retirement in 1909. This in itself is not so remarkable, a new professor setting up in a new position would want the latest research and teaching materials. Purdie’s appointment was a step-change in experimental research at St Andrews. The previous incumbents had been mineralogists, whereas Purdie had been influenced by the substantial growth that was taking place in organic chemistry at that time. What is remarkable however is that this table appears to be the only surviving one from this period across Europe. The University is keen to know if there are others out there that are close in age or even predate the St Andrews table. The years spent rolled up in a chem lab closet have not been kind to this possibly unique artifact of science history. The paper was mounted on a heavy linen backing which exacerbated its fragile condition and an immediate intervention was necessary to conserve it. Experts from the University’s Special Collections secured a grant to treat the chart. Working with private conservator Richard Hawkes, Special Collections conservators cleaned it, separated it from the linen backing, washed it in a neutral solution to remove discoloration, de-acified the paper in an alkaline bath, and repaired areas of loss with Japanese kozo (mulberry bush) paper and wheat starch paste. 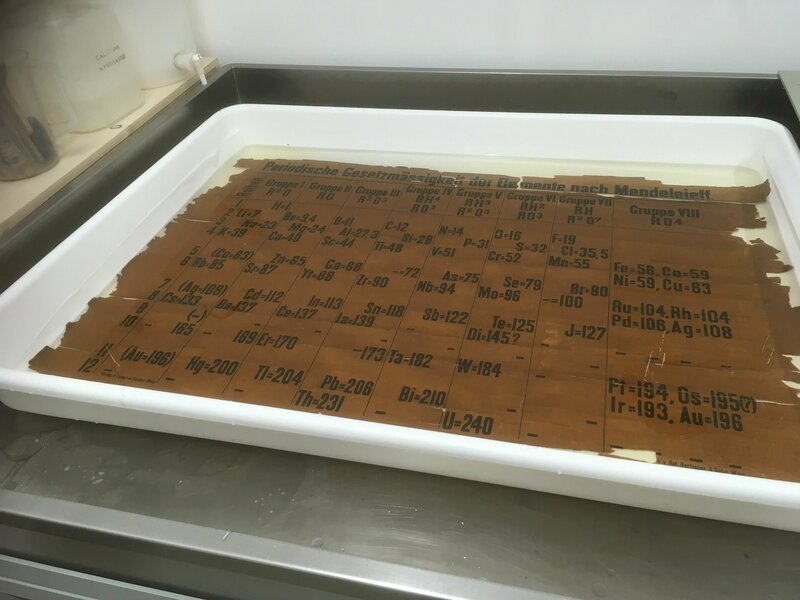 The periodic table is now stable and being maintained in climate-controlled conditions in Special Collections’ stores. It is too delicate a piece to go on public display. Thankfully the grant money also made possible the creation of a full-size replica. The facsimile is on display in the School of Chemistry. You are subscribed to email updates from The History Blog.